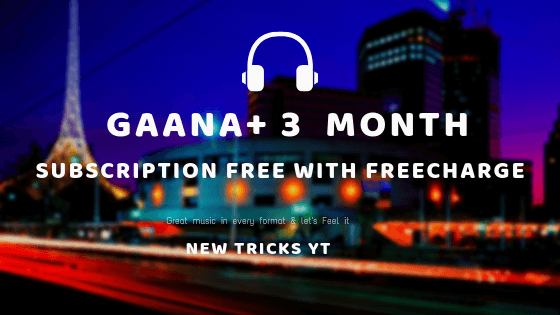 How To Get Gaana+ 3 Month Subscription For Free With Freecharge ? 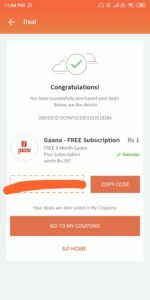 How To Redeem Gaana Plus Voucher ? My Views About Gaana App and Gaana+ Subscription! Listening music is the way to feel your emotions and there is a lot of application on the PlayStore which is providing us free music like gaana, spotify, saavn, etc. But the small problem in this application that is if you are listening a music and feeling your emotion but suddenly get some boring ads. But if you want to remove these ads, these companies asked to pay some money so they can remove these ads and you can feel your music freely. 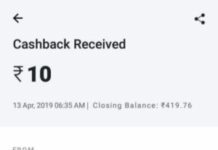 But don’t worry today we are going to share you a simple trick that can help you to get a 3 month gaana plus subscription for free or @ Rupees 1. So let’s explore this trick, before we starting this trick I want to make sure that you will get next update notification by clicking on Bell icon or joining us on telegram channel by clicking at here. 1, First of all you need to download or update freecharge application. 2.Open app and login / sign up using your details. 3.Now click on office tab and find gaana subscription offer just scrolling the offers. 4.Now click on buy deal now and pay 1 rupees using any payment method. 5.You will get your gaana plus subscription voucher on your mobile screen. 6.Now just Scorpio gaana plus subscription voucher and redeem it into your gaana application and enjoy your three month free gaana plus. 7.Now follow the below trick to redeem your gaana plus subscription voucher. Login / signup into your gaana app. 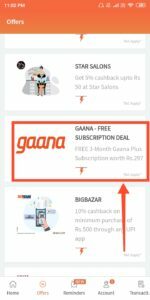 Enter your unique voucher code and enjoy gaana plus subscription for 3 month absolutely free. 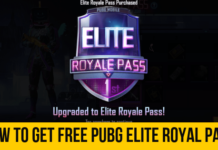 Apply the code under redeem section. 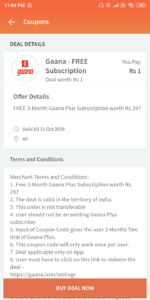 If you get any error regarding your gaana plus subscription voucher you can contract with gaana support service. Everyone like music whatever their language and like you i am also grate fan of best music. In past couple of years in am using gaana app and youtube to listen my favourite music. and i will definitely go for this gaana plus subscription right now because it’s 1 Rs. to get a ads free music for 3 month. And i don’t think is to much amount which is not affordable, maily if your are using internet in this era. what’s your opinion please comment below i am very excited to know that.